A how-to guide to facing death and living life by the popular novelist and cancer survivor. When Hoffman (The Dovekeepers, 2011, etc.) received the diagnosis about her lump, her immediate response was denial: "I was busy after all, the mother of two young sons, caring for my ill mother, involved in my writing. My most recent novel, Here on Earth, had been chosen as an Oprah Book Club Choice; an earlier novel, Practical Magic, was being filmed in California with Sandra Bullock and Nicole Kidman. I didn't have time to be ill." Once she came to terms with the fact that disease doesn't necessarily strike at our convenience, she was able to deal directly with her situation, put her life in perspective and get her priorities in order. She was one of the lucky ones--15 years later, she remains very much alive and productive, capable of writing the book that might have helped her when the shock of cancer blindsided her. "In many ways I wrote Survival Lessons for myself to remind myself of the beauty of life, something that's all too easy to overlook during the crisis of illness or loss," she writes. Though Hoffman has earned renown as a talented writer, this isn't really a writerly book, but more like conversational advice from a close friend. Most of the advice is common sense, yet the element of choice is crucial when faced with a fate that seems beyond your control. You can choose how to respond and put your crisis in perspective: "Good fortune and bad luck are always tied together with invisible, unbreakable thread." Hoffman ends with words of wisdom from her oncologist, who advised that, "cancer didn't have to be my entire novel. It was just a chapter." In other words, this too shall pass. A lightweight but heartening book. Since that remarkable beginning, Alice Hoffman has become one of our most distinguished novelists. She has published a total of twenty-one novels, three books of short fiction, and eight books for children and young adults. Her novel, Here on Earth, an Oprah Book Club choice, was a modern reworking of some of the themes of Emily Bronte’s masterpiece Wuthering Heights. Practical Magic was made into a Warner film starring Sandra Bullock and Nicole Kidman. Her novel, At Risk, which concerns a family dealing with AIDS, can be found on the reading lists of many universities, colleges and secondary schools. Hoffman’s advance from Local Girls, a collection of inter-related fictions about love and loss on Long Island, was donated to help create the Hoffman Breast Center at Mt. Auburn Hospital in Cambridge, MA. Blackbird House is a book of stories centering around an old farm on Cape Cod. Hoffman’s recent books include Aquamarine and Indigo, novels for pre-teens, and The New York Times bestsellers The River King, Blue Diary, The Probable Future, and The Ice Queen. Green Angel, a post-apocalyptic fairy tale about loss and love, was published by Scholastic and The Foretelling, a book about an Amazon girl in the Bronze Age, was published by Little Brown. In 2007 Little Brown published the teen novel Incantation, a story about hidden Jews during the Spanish Inquisition, which Publishers Weekly has chosen as one of the best books of the year. Her most recent novels include The Third Angel,The Story Sisters, the teen novel, Green Witch, a sequel to her popular post-apocalyptic fairy tale, Green Angel. The Red Garden, published in 2011, is a collection of linked fictions about a small town in Massachusetts where a garden holds the secrets of many lives. Hoffman has been at work on The Dovekeepers, which Toni Morrison calls “.. a major contribution to twenty-first century literature” for the past five years. The story of the survivors of Masada is considered by many to be her masterpiece. Do you have a little treasure book or two on your nightstand? Is there a book you turn to in difficult times just to thumb through for a small word of advice? 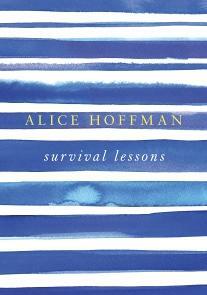 "Survival Lessons" by the incomparable author Alice Hoffman needs to be one of those books from now on. It's filled with wisdom, yes, but it's much more than that. It's a sort of recipe book for the trials of life, as well as the good times with people we love, and who love us back. I will confess that I've read every single one of Alice Hoffman's books since she began writing. I won't embarrass her or myself, but let's conservatively say that's been at least 25 years or more. She has been the maven of magical realism in every day life stories to me. When I lived in Wellesley, MA, raising my children there, and was a member of my long time book group...we adored Alice Hoffman. We understood her. Her books spoke to us of the special human relationships that filter out of the ether...and they smelled of salty ocean air, starlight and family secrets. Alice Hoffman is a conjurer of all things delectable and discernible. I waited every year or so for a new creation to come forth from her heart and pen. I have first editions of all her books. Does this tell you anything? So, when I received this little book I was beside myself with joy and anticipation. I knew she had something real and special to say about surviving the bumps and fault-lines of life and that it would be upbeat and positive, no doubt. It is. It's also clear and practical. It's practical magic because it's so simple and profound at the same time. I love that she zero's in on the exact point of pain and then carves it out with humor and compassion, giving a ready answer as to how it's best soothed and reconciled with a survivor's eye. Several times I had to smile, and a couple of times laugh out loud at her quick mind and how she held no punches at identifying things and people who hold us back in surviving life's ups and downs. "Survival Lessons" is a small, thin book that seems delicate and light-weight upon first view. It's beautifully packaged and fits nearly in the palm of your hand, which is perfect, of course. This is a book for everyone, not just cancer survivors. The insights you'll find are wise and worldly...and they're spiritually tipped, as well. I, for one, won't easily part with my copy. You'll need to get your own. I love this post! I was wondering how this book was. I'm collecting all her books as well. I adored the movie Practical Magic so I picked up the book and read it and loved it even better. I actually cried reading The River King. I've read a few more of her books and am amassing quite the collection. I agree her books are filled with "salty ocean air, starlight and family secrets." What a great quote. Thank you, Amanda, for the comments on my review. I can't imagine anyone not loving her writing!